The Loveland Probusters was founded in the early '60's, by a group of aviation enthusiasts, one who also flew homebuilt experimental aircraft. Several of our current members are or were private or commercial pilots, as well. We first flew off of an American Legion Post property in Loveland Ohio, and after vacating that site, we moved to a sod farm, also in the Loveland area. When we left that location we flew with a club in Georgetown Ohio, while we searched for our own field. In 1987, we Secured our present site on the Corps of Engineers property in the Spillway of East Fork Lake. We have a 30' x 300' paved runway, with an adjacent grass runway, and both ends have grass approaches. Our overfly area is one of the clearest and largest in the country. 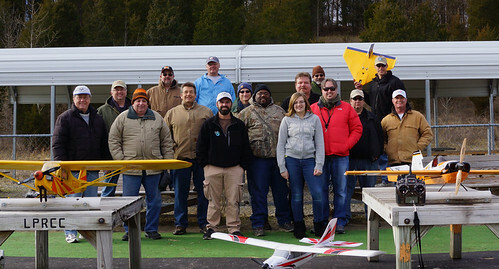 We are an AMA chartered club, and following their guidelines, we offer free flight training to our members. As a club, we fly on Wed eves and Sun afternoons. The field is open from 11:30 am until dusk. During the flying season, we have several types of events, e.g. : combat, glider, funflys and more. We also go to other related events at various locations. For additional information, you can contact any club officer. Please help us to get our Runway back in working condition - Any Amount will help and we will keep your donation anonymous if you wish.